The first patent for horizontal drilling technology was issued in 1891, just 30 years after Colonel Edwin Drake drilled the first oil well in Titusville, Penn. The primary use listed on the patent application, however, wasnt wildcatting, but dental applications. It took another 40 years for the scaled-up technology to find its way into the petroleum industry, and another 50 years after that before it became commercially viable to bend a well. The Alpine Field on Alaskas North Slope utilizes horizontal drilling  to help minimize its surface footprint while maximizing production. 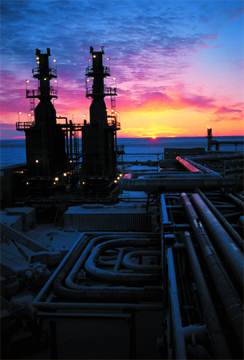 Image courtesy of Conoco-Phillips. Now, horizontal drilling seems more relevant than ever. With the ongoing debate about opening up more of Alaskas North Slope to oil exploration (see sidebar), the discussion often turns to new technologies that may have the potential to make oil extraction more efficient, more cost effective and more environmentally sound. This advantage makes horizontal drilling ideal for reservoirs that are shallow, spread out, fractured or in sensitive environments, such as the Arctic tundra, where drilling is controversial. The use of vertical boreholes in such locations would require more wells and therefore, more roads, pipelines and pads. Because horizontal wells can drain a larger area, fewer of them are needed, which means less infrastructure. These factors, along with several technological advances that have made the method commercially viable, have led to a 20-fold increase in the number of horizontal wells in the United States over the past two decades  from 1,000 in 1990 to 20,000 in 2000. The technique has increased production of some oil and gas fields, opened more types of fields to production, and revived or prolonged the life of fields that were almost exhausted. The first true horizontal oil well was drilled in 1939, in Morgan County, Ohio. By the 1970s, the most common non-vertical drilling technique forced a drill bit to slowly deviate from vertical by carefully positioning plates, called shoes, in the borehole. The method, called deviated drilling, was hard to control, especially with a motor at the surface rotating the rigid drill string (which connects the drill bit to the motor). And although it allowed up to a 45-degree turn, it had a very low build rate: The angle could be achieved, but only over a great distance. If your objective was 10,000 feet down, you could reach out maybe 8,000 to 10,000 feet from your surface location, but that would be it, Hite says. The innovation that made modern directional drilling possible on a large scale came in the 1980s. The steerable downhole motor, an engine attached behind the drill bit that could be controlled from the surface, was first used in drilling directional wells offshore, where the cost of erecting multiple rigs is prohibitively expensive. The steerable downhole motor is the big deal in terms of being able to do horizontal drilling, Hite says. Steerable motors are often used in combination with measurement while drilling (MWD) technology, in which instruments monitor variables in the borehole, such as position, temperature, pressure and porosity, and communicate these, along with other data, back to the surface through pressure changes in the drilling fluid. This provides immediate data on the rocks being penetrated and eliminates the need to pull the drill string out of the borehole before logging, Houseknecht says. The advent of the steerable motor and MWD has increased build rates and borehole length dramatically. Angles of up to 110 degrees can now be achieved in just a few hundred feet, and the record reach of a horizontal well is more than 35,000 feet. Steerable motors have also led to the development of other associated technology. Normally, every 90 feet, the drill must be stopped while three 30-foot sections of pipe are screwed together and added to the rigid drill string. However, with the advent of the downhole motor, a rigid drill string is no longer necessary. The invention of flexible coiled tubing, continuously unreeled from a giant spool that can hold up to 4,000 feet, allows uninterrupted drilling and also decreases the equipment footprint at the drill site. A decrease in the footprint also comes from multiple horizontal wells being drilled from the same pad; drillers move the rig just a few yards away and start another vertical shaft. Although less common, it is also possible to drill multiple wells off the same vertical borehole. In this technique, called multilateral drilling, two or three horizontal boreholes, each a few hundred to a few thousand feet long, can be drilled off the same main stem, like the branches on a tree or a candelabra, Hite says. Multilateral drilling creates a drainage network in reservoirs with many isolated pockets of oil. Despite more widespread use of horizontal drilling, most oil reservoirs are still tapped directly from above. Horizontal boreholes cost twice as much to drill as vertical ones and thus account for only five to eight percent of all U.S. land wells, according to a 1999 Department of Energy report. One example of this is the Austin Chalk of Texas, a highly fractured Upper Cretaceous carbonate formation that is home to 90 percent of the United States onshore horizontal wells. The many vertical fractures in this oil-bearing limestone prevent the oil from easily traveling to the borehole or being concentrated in any one easily accessible trap. Production from the Austin Chalks horizontal wells, the first of which was drilled in 1985, is three to seven times higher than conventional vertical wells. Horizontal wells also increase production in shallow reservoirs, such as Alaskas Alpine sandstone, near the Colville River Delta west of Prudhoe Bay. Oil was discovered here by Arco Alaska in 1994  a time when the use of horizontal drilling technology was rapidly expanding. The Alpine field became the first on the North Slope to use horizontal wells exclusively, and it has become a testing ground for horizontal drilling technology in the Arctic. Directional drilling also allows more cost-effective development of offshore fields from onshore locations, even from three to four miles inland, without the threat of marine oil spills, which is a major concern for the Arctic Ocean ecosystem. For example, a record 35,000-foot horizontal reach was drilled in the United Kingdoms offshore Wytch Farm oil field, from an onshore rig. Other techniques unique to cold region drilling include using ice to build roads, airstrips and drill sites for winter exploration  avoiding the use of sand and gravel. In many instances ice is chipped from lakes and used like crushed rock to build roads, airstrips and pads, Van Dyke says. New technologies have also helped drilling operations more effectively deal with waste. Reinjecting muds and cuttings back into the borehole at a greater depth reduces surface impacts. Although the degree to which these technologies may lessen the environmental impact of drilling is still under debate, both economics and environmental concern have driven technological advances over the past century and likely will continue to drive future efforts. On Jan. 22, the Bush administration unveiled its plan to lease land in the northwest portion of the National Petroleum Reserve-Alaska (NPRA) for oil and gas development. The Bureau of Land Management (BLM), which oversees NPRA, will soon begin leasing 8.8 million acres of federal land in the reserve. The NPRA, set aside in 1923 to provide for future energy needs, is roughly the size of Indiana, sitting in the far northwest corner of Alaska, north of the Brooks Range and west of the Arctic National Wildlife Refuge. The mostly undeveloped land hosts between 5.9 and 13.2 billion barrels of technically recoverable undiscovered oil, according to a 2002 U.S. Geological Survey (USGS) report. Until now, however, oil and gas exploration has been limited in NPRA because of the high costs associated with finding, developing, producing and transporting to market the technically recoverable oil resources, according to the USGS report. At market prices of $22 to $30 per barrel, USGS estimates that only 1.3 to 5.6 billion barrels of oil would be economically recoverable, significantly less than the amount of oil estimated to be in place. Although the NPRA represents a relatively small resource, Ed Porter of the American Petroleum Institute told the Washington Post on Jan. 23 that opening the reserve to more leasing is important. Additionally, with American dependence on foreign oil growing each year, energy from the NPRA can help in the long term to increase domestic energy production and stabilize prices, said Secretary of the Interior Gale Norton in a press release. Under BLMs new management plan, 7.23 million acres will be available for energy leasing beginning June 2, when a sale will be held. Another 1.57 million acres will be deferred for leasing for 10 years. Companies will be subject to strict environmental standards, BLM says, that will apply especially to exploratory drilling, waste prevention, water use, transportation and seismic activity. Additionally, BLM set aside 102,000 acres of important migratory bird and marine mammal lagoons for protection from any permanent structures. BLM also designated no-surface-occupancy stipulations along coastal areas, in deep-water lakes and along some rivers, and created special study areas for threatened or endangered waterfowl and caribou. While the environmental restrictions are designed to keep the footprint of oil and gas development small, many environmental groups say the efforts are not enough. We were looking for balance in the NPRA plan  a compromise, says Dierdre McDonnell, an attorney with Earthjustice in Alaska. Instead, she says, environmental restrictions were actually weakened with the BLM plan. The industry operating procedures that are designed to lessen the footprint, such as those that prohibit travel close to lake or river shores, are not enforceable, she says. Development on the North Slope continues, however. ConocoPhillips, which owns an interest in most of the existing North Slope oil fields as well as the trans-Alaska pipeline, has pledged an 11 percent increase in the amount of money it will spend on oil and gas exploration and other related projects in Alaska in 2004. Groundwater cleanup often takes numerous wells, drilled straight down into a remediation site, to provide access for either cleanup of an aquifer or removal of harmful chemical substances. But the prospect of sinking dozens of vertical wells into the tarmac at John F. Kennedy (JFK) International Airport did not present a viable solution to cleaning up jet fuel that had seeped into the underlying filled land and marshland. So, in 1993, the Port Authority of New York and New Jersey decided to take advantage of what has become an important  though rare  tool for environmental remediation: horizontal directional drilling. Since the 1980s, the technology has allowed contractors to set pipelines underground without opening trenches, and it has been used by utility companies laying water and gas pipelines and telecommunications companies setting down fiber optic cable, in addition to the more established applications in the oil industry. In the mid-1990s, companies working on environmental projects to clean up chemical plumes or other contaminants, sometimes in unexpected places, began to take advantage of the technique. Its exploded; its a huge, huge market, says Mike Sequino, an engineer and vice president of Directional Technologies, in North Haven, Conn., who conducted a test run at the JFK International Airport of three 200-foot horizontal wells. Today, thousands of feet of pipe extend from more than 50 horizontal wells, drilled by A&L Underground (a company based in Lenexa, Kans. ), underneath tarmac where airplanes refueled  and spilled fuel  for more than half a century. After working for oil companies drilling horizontal wells, Sequino started his own company, laying trenchless pipes for utilities. He slowly started taking on environmental projects  drilling horizontal wells that facilitate the injection and extraction of chemicals, in some cases volatilizing hydrocarbons and sucking them out, and even the introduction of microbes for bioremediation. Its sort of like an oil well: You drill a pilot hole down to the target depth, then go to the target distance, go past it, then drill up and pop out, Sequino says. In particular, for petroleum-contaminated sites, Sequino says, the technology allows cleanup of oil or gas that has migrated beneath a building, somewhere companies dont want to drill. With horizontal drilling, its possible to explore the netherworld beneath a building  or road or wetland  without disturbing what is above it. Plus, horizontal drilling in sensitive environments such as wetlands can ease permitting requirements necessary for traditional drilling. Using a normal drill bit and pulling through the same piping materials  even using the same mud slurries that keep the drill bits lubricated  the horizontal drills for environmental to industrial applications are a scaled-down version of the oil industry, Sequino says. The pipes, called screens, are sliced with tiny holes that are smaller than the prevailing grain size of the subsurface material, says Frank Canon, a senior account representative for Baroid, a subsidiary of Halliburton in Magnolia, Texas. Canon is responsible for the slurries used to cool drill bits. Some problems, however, still occur with the technology: For example, a portion of northbound Interstate 81 sank in Roanoke, Va., because of the partial collapse of a horizontal directional drill tunnel for a gas pipeline, as reported by the Roanoke Times & World News last October. Tracking the material through which a drill is eating its way is difficult, Sequino says. Tunnels can collapse if drilled incorrectly, or drill bits can hit rock and cobble, deflecting them. The radiocommunications system that signals depth and position to a crew aboveground doesnt tell you what type of material you are in. Experience as to where you are in the country and how you do your mudlogging, or logging of the core samples the drill kicks out, makes the difference, he says. Kaback has been developing and tracking horizontal drilling since its inception, and promoting its applications for environmental remediation. She estimates that anywhere from 25 to 40 companies across the United States are using the technology. Such drilling, Kaback says, could go wrong without proper planning and consideration of the subsurface geology. But, she says, the technology is pretty mature and not as widely applied in the environmental field as she thinks it should be. Part of the reluctance to use horizontal directional drilling may be cost, as it is more expensive per foot than vertical wells. However, Kaback says, in the case of an environmental application, the initial outlay for horizontal technology is amortized over the lifetime of a remediation project. The biggest advantage, though, comes from continuing to operate normally above a drill site, Kaback says, noting the horizontal wells installed at JFK airport. Put in place underneath the wings of active planes, surrounded by baggage carriers, kitchen vans and fuel trucks, they continue to clean up the airfield. Pratt is a Geotimes contributing writer based in New Hampshire.